Leaked details from an upcoming feature on Star Wars: The Old Republic say that space combat will be a limited experience. I'm labeling this one as pure rumor until clearer details come to the surface, but a German fansite that claims to have its hands on a future article covering Star Wars: The Old Republic's space combat feature, which was revealed last month. Though the translation is not perfect, Online Welten (translated by Google) alleges that the game's space combat will be "on rails." What this means is that my dream of a Tie Fighter side-game being added to The Old Republic has been killed. The translation likens space combat in BioWare/LucasArts' upcoming MMORPG to that from Star Wars: Rebel Assault, an interactive movie-style game from 1993. 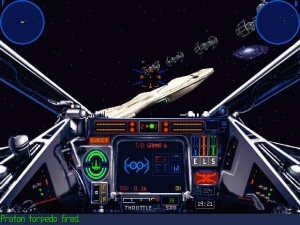 Space battles in Rebel Assault had players moving along a set path while simply aiming the targeting reticule at attacking enemies. Space combat in The Old Republic is referred to as a "tunnel-shooter." The translation says BioWare preferred on-rails combat because it was more accessible. It's also called a "quick snack" with missions not taking very long to complete (the translation appears to say that none will take longer than 15 minutes, but is unclear), and is completely unnecessary if you don't want to play it. The article straight up crushes my heart by saying:"A complexity as in X-Wing or Tie Fighter is not available, the space combat is more for casual players." Did they have to be so harsh? Tie Fighter and X-Wing are two awesome Star Wars fight combat sims from 1993 that had mounds of missions and some branching story paths depending on completed mission objectives. So we won't be getting a ton of freedom, should this article turn out to be correct and translated properly (and I should stress that it very well might not be), but that doesn't mean the on-rails space combat will be garbage. If you've never played World of Warcraft, it has plenty of on-rails flight missions where players must bomb predetermined areas or "shoot" at enemies as they fly by, so this really shouldn't be considered bad news. I mean, did we really expect BioWare to put an entire flight sim into The Old Republic? I didn't, but why not hope for the best? [UPDATE]According to an article in PC Gamer (found on the SW:TOR forums), the space combat is indeed on rails. Players can move up, down, left, and right to avoid asteroids and such, but do not control their basic course. The missions will take 2 to 8 minutes, with PvP and multiplayer missions promised. The space combat is meant to be a cinematic experience. I'm still waiting until I play it to judge.